The university authorities revealed that the minister assured aid in research and scholarships to students and faculty members. 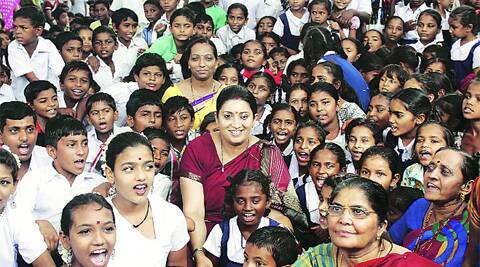 In an attempt to study and replicate Gujarat’s education model, Human Resource and Development (HRD) Minister Smriti Irani, along with her team, visited various educational institutes in Gandhinagar on Friday. She started the day from a government primary school at Kudasan, a small village near Gandhinagar, where she shared the midday meal with the students. She participated in the enrolment drive, Shala Praveshotsav and Kanya Kelavani, organised at the school. “Gujarat would certainly become a source of motivation for the entire nation on how to increase and achieve 100 per cent enrolment rate. The team with me is here to study and understand schemes like Shala Praveshotsav, Gunotsav and the teachers’ training programmes in the state so that these can be replicated elsewhere too,” Smriti said. “The best example I witnessed today towards this direction is from a primary school in Gujarat where, during Shala Praveshotsav, the entire society, along with the local administration and state government, is working towards 100 per cent enrolment and how it is being transformed into a technical university like PDPU,” she added. “A student will learn through a combination of knowledge with technical ability at this smart school. I also witnessed students using this technology and I wish that this concept reaches each school in Gujarat and across the nation,” she said, inaugurating Kudasan Primary School, where students would be taught with the help of a computer software that enables them to learn in an interactive mode. “The minister has asked me to send a proposal to open such smart schools in each village,” said Gandhinagar district panchayat president Heena Patel of Congress party. At PDPU, Smriti had a meeting with the faculty members in the presence of Education Minister Bhupendrasinh Chudasama and Finance, Energy and Petrochemical Minister Saurabh Patel. “I have sought guidance from the faculty on two issues so that these could be duplicated and replicated in the nation for the uplift of the society. There are two special programmes being conducted here which are also of my interest. One is engineering and liberal arts and the other rural internships. During vacations at the campus, students reach out to community and villages for their uplift,” she said. The university authorities revealed that the minister assured aid in research and scholarships to students and faculty members. Later, she also inaugurated a Central University and visited the Indian Institute of Technology, Gandhinagar.